After a weekend in Chicago, news of dinner at Table 52, and a friend on Facebook status updating to say he waved to Mr. Pres and he waved back, I've got Obama on my mind. But I'm not talking about stimulus bills and politics. When Michelle Obama was announced as the latest First Lady to grace the cover of Vogue, Kathy Lee Gifford and Hoda Kotb commented that she had great arms and must work her upper body. At inauguration time, a photo circulated through my e-mail linking to a photo of Obama riding through Hyde Park on a bike. 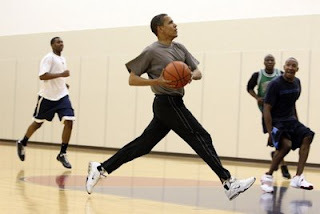 OK, that seemed to poke fun at our Chief of State, but he is known for shooting hoops. Hence the announcement that daughter Sasha would be joining a basketball team at her new school. So with all of these active Obamas, it didn't surprise me in the least when a few weeks ago my guilty pleasure reading on People.com uncovered dirt on the Granny-in-Chief, Michelle's mother. Turns out that the woman many media outlets have started calling the First Granny, Marian Robinson, loves doing yoga. And she's not the only one in the family getting limber. Robinson's yoga partner is Sasha and Malia's godmother, Eleanor "Mama Kaye" Wilson. Robinson's younger brother, Stephen Shields, serves as their yoga instructor. PS Apologies for any lackluster posts by me the past few days, I feel like I've been in a mental fog. Hope to snap out soon!